The American Red Cross and The Salvation Army established an emergency shelter on the Contra Costa College campus on Wednesday, October 11. As of 3:00 p.m. on Friday, October 13, there are no evacuees in the shelter. If you’d like to support wildfire relieft efforts, below are ways to help. The biggest need right now is monetary donations. Individuals interested in volunteering are asked register with the Red Cross or other agencies (links below) so they do not overwhelm shelter operations and can be deployed where needed most. American Red Cross – Trained Red Cross volunteers are currently staffing shelters and supporting residents. As the disaster continues to evolve, the Red Cross will assess how community volunteers can best support the operation. 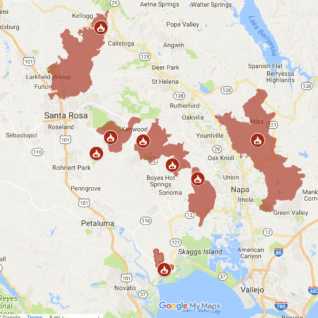 Those interested in volunteering to support Sonoma, Napa, Lake and Mendocino wildfire relief efforts, can sign up: tinyurl.com/RedCrossVolOctober2017. No donations of clothing, food or other items are currently being accepted for the emergency shelter at Contra Costa College.